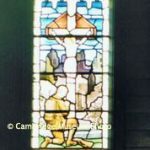 St Andrews Anglican church World War One memorial windows were unveiled on 11 December 1923 (the same day as the cenotaph in Jubilee Gardens). Lord Jellicoe addressed the gathering and the Bishop of Auckland, Bishop Averill, dedicated the windows. The three windows comprise three figures depicting Truth in blue, Freedom in red and gold, and Justice in purple and gold. At the foot of these figures, the scene on the left represents the landing at Gallipoli, 25 April 1915 – the first engagement of New Zealand troops. The middle window shows a wayside crucifix outside the ruined city of Ypres, Belgium with a soldier kneeling at the foot of the cross. This was the longest battle, lasting from 31 July to 10 November 1917. The scene under the right hand window represents the capture of Le Quesnoy, 4 November 1918 – the final engagement of New Zealand troops. Running along the base of the three windows is the inscription “Their name liveth for Evermore”. There are 42 Cambridge names under the memorial windows with the inscription “To the Glory of God and in Memory of these Men who gave their Lives in the Cause of Truth, Freedom and Justice in the Great War 1914-1918. Remembering these dead, let the Living be Humble”. The memorial windows were erected by the relatives of the members of the Anglican church who died in the war of 1914-1918. Research shows that local men (of that time) who died in these battles were: Ernest Wilken Cox, Francis Asbury Paine and Holgar Bro Randrup on 25 April 1915 at the landing on Gallipoli; no Cambridge men died at Le Quesnoy and ten Cambridge men died during the Ypres operation. The New Zealand memorial at Le Quesnoy is a large stone sculptured panel let into the ancient wall, showing the New Zealanders scaling the wall being watched over by a large figure symbolic of Victorious peace. In French and English are the words “In honour of the men of New Zealand through whose valour the town of Le Quesnoy was restored to France, 4 November 1918. ‘De l’autre extremite du monde’ unveiled at Le Quesnoy 15 July 1923”.